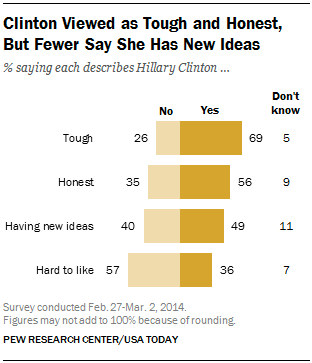 A new poll takes an in-depth look at how Americans perceive Hillary Clinton. Pollsters find common ground in New York, New Jersey and Virginia. And Americans think Republicans are out of touch, but plan to vote for them anyway. This is HuffPollster for Tuesday, March 4, 2014. How old is Clinton? - "When asked an open-ended question about how old Hillary Clinton is, 57% of respondents offer an age in the 60s and 31% give an age in the 50s; very few think she is 70 or older (3%) or under 50 (6%).In fact, the public tends to underestimate Hillary Clinton’s age (she is 66). About eight-in-ten (83%) give an age of 65 or younger, 2% volunteer her exact age, and just 12% give an age of 67 or higher. The median age offered is 60."